Fudgy 2-bite brownies dripping with a super simple chocolate truffle ganache, all topped off with chopped nuts for a nice crunch on top... like a perfect combination of classic brownies and a box of Valentine's Day nutty chocolate truffles! 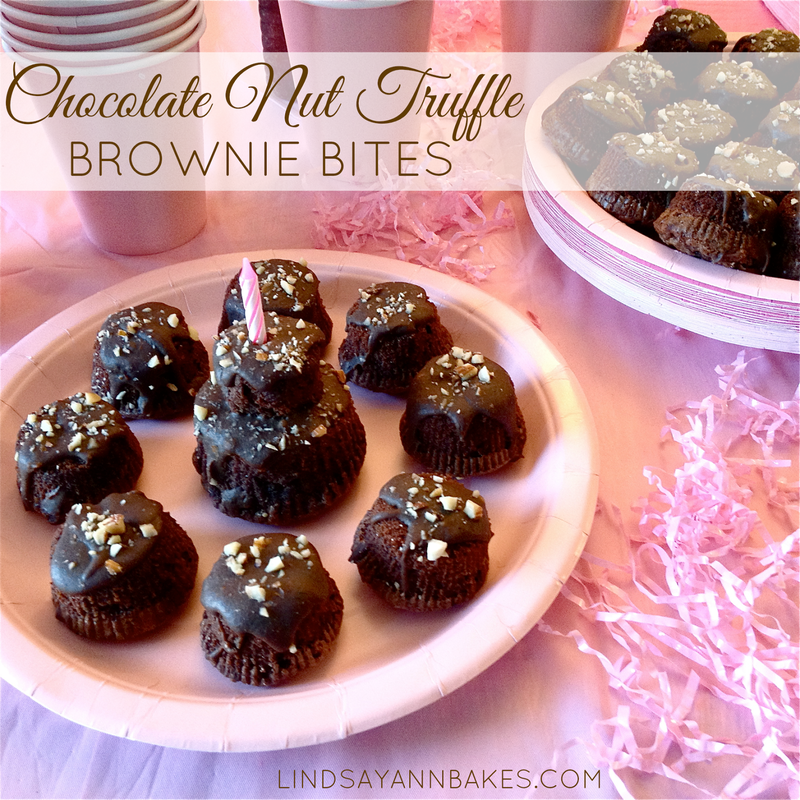 To make the little brownie bites, I just baked my favorite fudge brownie recipe in a mini muffin pan. Once they baked and cooled, I flipped them upside down to get the little volcano shape, squeezed the ganache on top and sprinkled on some chopped almonds for garnish. So easy, yet so impressive! Preheat the oven to 350 degrees F. Line a mini muffin pan with baking cups or spray with non-stick spray. Stir together melted butter, sugar, cocoa, and salt in a medium mixing bowl. Add the vanilla and eggs, one at a time, stirring vigorously after each addition until batter is no longer grainy and becomes thick, smooth and shiny. Stir in flour and baking powder until just incorporated. Bake for about 30-40 minutes, or until an inserted toothpick comes out with a few moist crumbs sticking to it. Do not over bake. Cool brownies completely, remove baking cups and flip brownies upside down. In saucepan, heat cream and butter over medium heat just until it starts to boil. Place chocolate in a small bowl and immediately pour just boiled cream on top. Let sit for a minute and then gently stir until smooth. Let sit to thicken slightly and then spoon/pipe/drizzle over the tops of the brownies and sprinkles chopped almonds on top.